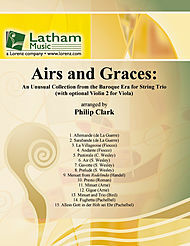 Airs and Graces: An Unusual Collection from the Baroque Era for String Trio – Set of Parts arranged by Philip Clark. String ensemble. For String Trio (violin). Grade 2.5. Published by Latham Music Enterprises (702358). The perfect set of short pieces for those long gigs. Includes optional Violin 2 for Viola. (For score see item 702359).